Emergency stop switches, or E-Stops, are a critical system component that protect the safety of both operators and machinery in a variety of emergency shut down situations. Depending on a customer’s end product and market, E-Stops are regulated by a large range of international safety standards that cover both the performance specifications of the switch, and the need for an E-Stop on equipment and machinery. RAFI has expanded their portfolio of E-Stop products to include the LUMOTAST 22 and LUMOTAST 16 one piece switch solution, as well as specialty sealed and ergonomically pleasing variants of the RAFIX 22 FS+ and RAFIX 22 FSR actuator styles. With eight unique families of E-Stop products ( LUMOTAST 16, LUMOTAST 22, LUMOTAST 25, RAFIX 16, RAFIX 22 FS+, RAFIX 22 FSR, E-Box, and RAFIX 22 QR) and hundreds of actuator and contact styles and ratings, RAFI’s comprehensive line of E-Stops fill the most challenging customer demands across a wide variety of industry applications. The LUMOTAST 16 is a compact one piece construction E-Stop that includes the twist to release actuator and electrical contacts. The LUMOTAST 16 mounts in a standard 16.2 mm panel cut out and sits just 16 mm behind the panel so the E-Stop will fit the most critical customer spacing requirements. The LUMOTAST 16 meets an IP67 degree of protection for moisture and water egress, and is available in a variety of contact configurations. The LUMOTAST 16 is supplied with quick connect terminals which can also be soldered. Similar to the LUMOTAST 16, the LUMOTAST 22 is a compact one piece construction E-Stop which mounts into standard 22.3 mm panel cut out, sitting just 17.6 mm behind the panel. The LUMOTAST 22 is capable of switching 2.5 A at 250 V, and is available with a variety of contact options and optional illumination of the arrows on the actuator. With an IP65 degree of protection of moisture and water ingress, the LUMOTAST 22 is suitable for a wide range of customer applications. 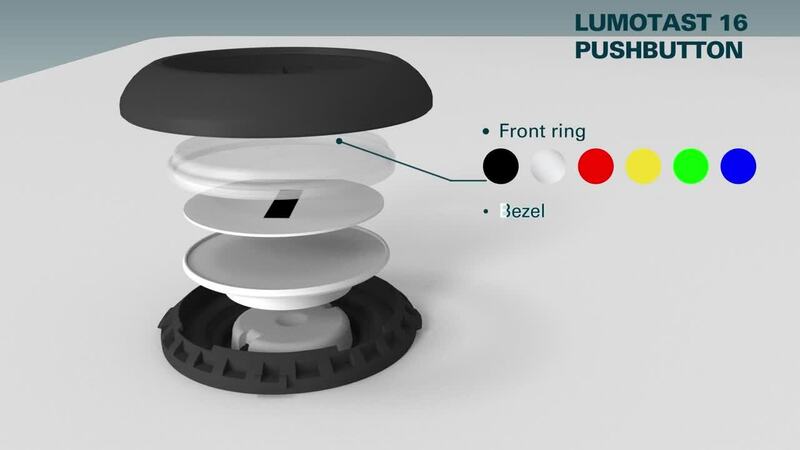 The LUMOTAST 25 is 16 mm E-Stop with a compact, push-pull actuator system, in a one-piece construction, that incorporates a connector system into the E-Stop body. The LUMOTAST 25 sits 30.7 mm behind the panel, and can be mounted by flat ribbon cable or a PCB socket. The LUMOTAST 25 is IP65 rated for moisture and water ingress. The RAFIX 16 is a traditional two-piece 16 mm industrial control, incorporating a variety of E-Stop actuators with standard RAFIX 16 contact blocks, capable of switching up to 6 A at 250 VAC. The RAFIX 16 E-Stop is part of RAFI’s RAFIX 16 family of industrial controls, including pushbutton, keylock selector, and panel indicators that incorporate the same standard terminal blocks as the E-Stop. The RAFIX 16 is available with a variety of accessory products, including protective caps and covers, labels, and a PC socket so the RAFIX 16 can be mounted a printed circuit board. The RAFIX 22 FS+ is a comprehensive line of industrial controls that can incorporate either a PCB mounted contact block at slim 9.2 mm behind the panel depth, or optional quick connect terminal block which sits at 27 mm. The RAFIX 22 FS+ E-Stops include actuator styles available with optional illumination, are IP65 rated, and are twist to release. Available with a wide variety of circuit options, the RAFIX 22 FS+ is rated up to 4 A at 250 V.
Designed for extremely harsh and ruggedized applications, the RAFIX 22 FSR E-Stop actuator, features a robust metal body and optional metal mushroom head, capable of IP65 and IP69K protection against moisture and water ingress. The E-Stop is part of the RAFIX 22 FSR ruggedized industrial controls that work in conjunction with the RAFIX 22 FS+ contact block systems. RAFI’s innovative E-Box is a plug and play IP65 rated easy mounting slim housing, which works in connection with an M12 connector system. The E-Box is just 28.6 mm thick and 40 mm wide, and mounts easily to standard 40 mm din rail systems. The E-Box works in conjunction with the RAFI 22FS+ product family and can be provided with any two actuator styles, such as a green pushbutton for re-start or keylock switch for a protective lock out feature. The RAFIX 22 QR is a traditional 22 mm actuator and interchangeable contact block system, designed for high power industrial applications. Capable of switching 10 A at 250 V, the RAFIX 22 QR E-Stop and product line are a modular approach, which quickly snap together actuators and the contact block to a coupling system. Available with and without both LED and Incandescent illumination options, the 22 QR product family contact block systems are available with screw terminals or spring activated cage clamps. The E-Stop actuators feature a large 40 mm surface, available with twist or pull to release, illumination, windowed, or integrated keylock to reset feature. RAFIX FS Series Familiarize engineers, designers, and customers with the RAFIX FS Switch Configurable series. RAFIX 22QR Series Overview Familiarizing engineers, designers, and customers with the RAFIX 22QR Switch Control Components. LUMOTAST 16 Series Compact Pushbutton Switches RAFI's LUMOTAST 16 series is ideally suited for designs that require both customizable switch input, and emergency shutdown capabilities. RAFIX 22 FSR Switches and Push Buttons RAFI's RAFIX 22 FSR switches and push buttons are designed for rough outdoor use where dust, dirt, lubricants, moisture, and extreme temperatures are present. Active/Inactive E-Stops RAFI's active/inactive versions of the Lumotast 16, Lumotast 22, and RAFIX 22 FS+ E-stops feature a lighted mushroom head and are ideal for handheld devices. Mechanical Buttons and Switches Address Critical Design Requirements Mechanical buttons and switches come in many forms to help designers meet various safety, security, ease of access, and power-up configuration requirements.